Successfully Added 5 Inch HD Touchscreen GPS Navigator (WiFi, FM Transmitter, High Power CPU) to your Shopping Cart. For the first time ever, you can now surf the internet with a portable GPS navigator! Utilizing the lightning fast AtlasV chip, 4 GB memory and the Windows CE 6.0 operating system, this 5 inch HD Touchscreen GPS Navigator offers you a spectacular combination between power, performance, and battery efficiency. Along with a rich media enhanced operating environment, this product gives you the best user experience possible. Great GPS Device: This product runs on the Windows CE6.0 operating system which is the premier OS choice for all the popular GPS devices. Load in your maps and experience amazing features like lane assist, voice guidance, 3-D views, intelligent route planning, along with dedicated night mode to make it easier on the eyes when driving. Your Tablet Computer with GPS Function: This handheld wonder supports a wide variety of multimedia files including MPEG, WMV, ASF, AVI, DAT, and features a stunning 5 inch touchscreen TFT LCD screen to bring all your videos to life! With the FM transmitter, whatever plays on your GPS navigator can broadcast through your car speakers for the maximum sound effect. 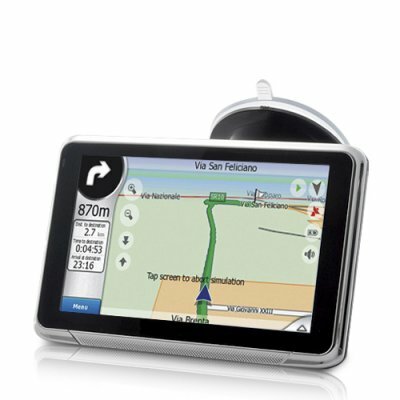 With WiFi function, this GPS navigator doubles as your tablet computer. Read news, watch live videos, or chat with your friends while you are waiting in the car for your wife who’s patiently checking out every store of the mall. You can also take it home and play games while comfortably stretching out on your couch! Use it as a handheld or mount it in-car with the free car kit. This product also comes with a Car Charger, AC adapter, USB cable, Mounting Bracket and everything you need to use it straight from the box! It powers on instantly, comes with an incredibly responsive touchscreen and is compact enough to fit in your pocket! Be Smart - Add to Cart! Buy one for yourself and a couple more for your parents and relatives. Then stock up a bunch for your online store. Brought to you by the online leader in direct from China wholesale electronics - Chinavasion. OSD Menu Languages: English, French, Spanish, Portuguese, Italian, Vietnamese, Arabic, German, Hebrew, Russian, Thai, Greek, Romanian, Turkish, Finnish, Slovakia, Polish, Magyar, Malaysian, Netherlands, Danish, Norwegian, Swedish, Czech.